Hi my name is Shawnita and this picture was taken on the night of my bachelorette party with my friend's camera phone. It was taken at Ah-so (a restaurant) and where I was sitting there was no way any one was behind me. At Ahso they have it where they cook the food with you there and where I was sitting is where the cutoff to the grill is situated. So I know for a fact there was no one behind me. 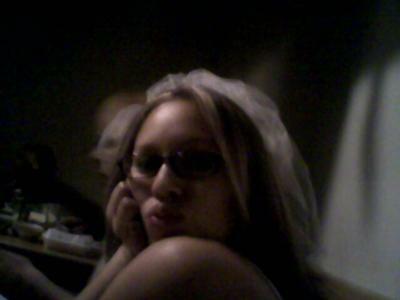 There is the entity behind me and on the top of my veil, there is a white cloud thing. I'm not sure if that's part of my veil or not. I made the picture brighter and you can see a man screaming with an orb of light on his head. Definitely not the veil. It looks like a part of your veil if you ask me. people can't make faces out of just about anything. It is clear I see the face, but I think it's just a part of your veil and how it was turned at that moment. Good pic though. It is your veil. It's an optical illusion. The light is reflecting off the white material and casting a glow. And the material of the veil is appearing to look like a face. But if you look at what would be a nose it is very pointed and sharp . That is the fold of the material. It looks more like a clown either than good picture. Your brother was at the party with you. Good spirits can't come and go as they please but are often spotted at their family members' special/important life events and parties. I stared at it for a few seconds. I made the 1st attempt of looking ''into'' it. What I did the 1st attempt was look closely. The hair of the ''person'' turned red as one of the other people that commented said. The 2nd time I tried optical illusion. It appeared perfectly on my wall. When I looked the face was entirely visible. Not just her veil, if you look towards the bottom of the picture, there is arm a little below the elbow and short the whole hand right behind her, and it shows a height of a person but it has the same transparent look of the head. Does any one else see that? If you look closer or fade the light on your computer screen, it looks as though its an old woman's head, there is a tint of gray in the hair. Then the red blur right above her vail actually continues a little behind you. Try looking into where you had your party, and see if there is any history behind the place. Sorry but that is not a ghost. I don't care how many times you enlarge that picture it is her veil. Oh it's so coincidental that there is a ghost the same texture and color of her veil right on the other side of her head??? I think not. Maybe to the untrained eye. The "thing" off the side of her head is in fact her veil.. it is partially in front of the view of another person at a different table.. the white you see is her veil and the tan is the bald head of the man at the table behind her you can also see a bit of his nose. Guys sorry to interrupt. But I did enhance this pic. And enlarged it. I can be very sure that it's not her veil. To me it look like someone's face. I can clearly see his/her facial line. Eye(hollow), nose, lips, jawline. There is a white skull as well as the cloud freaky! Who ever looks at this picture make sure you look straight at the tan spot and the veil left of her head and you will clearly see a face staring right back at the camera. You might not see it right away but give it a couple of seconds and you will. I don't care if you believe or not part of the face staring back the veil is not even there and there is no camera or lighting malfunction. If anyone can explain please do, otherwise, honey that just might be your brother. I've been examining photos for awhile and in my own opinion this picture explains itself. Thank you for sharing. It's always difficult to look at a cell phone picture and pick out little details as most phone cameras are between 1 and 3 megapixels which is very low by digital photography standards. The white part is the veil but the tan section could be caused by a reflection or debris on the camera lens. Point being, it would probably look completely different if taken by a higher MP camera or a film camera. Technology is getting better but at this point, cell phone camera create questionable ghost pics. The camera is focused on her. This would leave anything in the background blurry. I think its blurred light from experience. It was most likely a spirit. As someone stated earlier you can see a arm, but if you look closer the arm is translucent which says that we may have a real ghost there. Good job on taking a great pic. I clearly see a face of a man right next to you. An ooooold man, and he looks blurry. The white is a part of the veil but the tan is what confused me... I am a firm believer in ghosts... in fact my apartment is haunted by two of them... but I have never seen either of them appear like the tan shadow in the photo the appear as light almost clear white figures that are very attached to my vintage guitar and clock. I think it could just be a light flux in the photo. That was very nice of you. What a nice way to say it. It is her veil, but what is that tan shadow thing, that's what I can't figure out. I am in no way saying it's a ghost, because I personally don't believe it is. But I just can't figure that part out. What do you guys think that is? That is your veil sweetie. If you look closely you can tell it is. I am a firm believer in ghosts. I am also an amature photographer. It looks like a ghost at first glance but if you follow the countours it is the flow of your veil and camera phones take kinda small low quality pics. But awesome photo. Well I can see how this does look like a ghost(i kind of think it is) but when you look closely it really looks like it is apart of your veil. It pretty weird and confusing at the same time because part of my wants to believe its a ghost and the other part really believes that is is just ur veil that looks like a face. It could have to do with the angle of the veil and the way your head is positioned. It looks like a girl is sitting next to you talking to someone across the table. You can see the arm at the bottom left of the photo as well. The veil is covering part of her face. I know it's easy to say this is fake, or 'just part of the veil', or some such. But what strikes me is that this has the same appearance of other photos of this type that I call 'peek-a-boo' ghosts. Those are seeming unexplained faces that always look like they're peeking over the shoulder of the unsuspecting person being photographed. They weren't seen at the time the photo was taken, but they show up in the photo itself, almost like they want to be included in the picture. For this reason alone, I'm prepared to give this one the benefit of the doubt. Everyone can have their opinion. Just be respectful. Kyle, please watch it. lame, ya I said it. Anyone can tell that that's a fake. All I see is someone beside you, and light against the wall. Shawnita you need to get out of all that Arizona sun and come back to reallity. Take a minute and look again, dear. Very creepy! If that is a person, he/she needs some sun and some plastic surgery. Does it resemble anyone you know that has died? Thank you for thinking of us and sending in this picture. My opinion, however, is that this is a motion blur of sorts or a double exposure. I know you said there was no one behind you, but perhaps someone walked by and you did not notice. I'm sure others will have different opinions. Regardless, it is an interesting pic and I thank you for sharing.